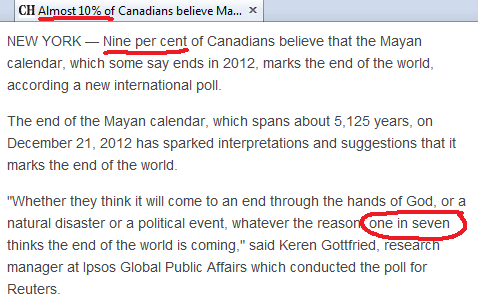 Check out this silly news article about a poll that was taken to see if people believe the world is going to end in 2012! AAaaackk!! Oh wait, it’s 1 in 7 now!! Close enough. Thanks to Mike for this submission! That 1 in 7 refers to the people who think the world will end in their life time, by any means not just by a Mayan apocalypse. I see no fail here, except on behalf of the poster. you should actually read the article first, next time. Actually, the number 1 in 7 refers to people worldwide. Not just Canadians. So it’s not a fail, just poorly written.